This picture of Dominion was taken in the late 1950s. You can see a Firestone Tire sign and a Texaco sign attached to the dealership. 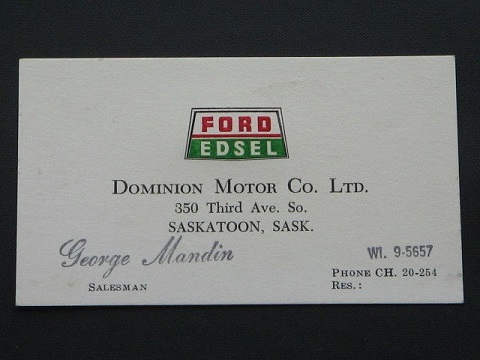 Dominion Motors was located on Third Avenue in downtown Saskatoon, Saskatchewon, Canada. 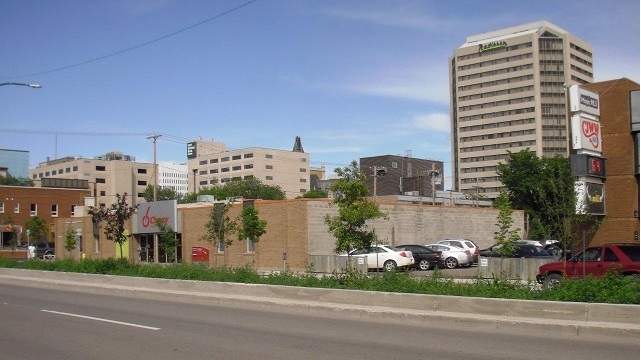 Saskatoon is located about 500 miles north of Billings, Montana in central Canada. 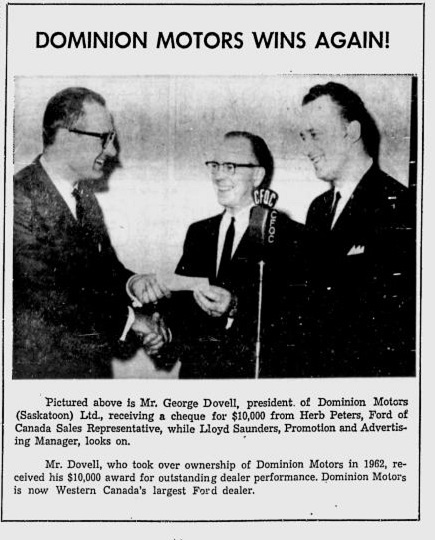 George Dovell took over the dealership in 1962. Here, he is recognized by Ford of Canada. Here is an original business card from the dealership. It's probably from the late 1950s. We all know, Mustang was a big deal. The first Mustangs at the dealership were met with quite a fanfare. 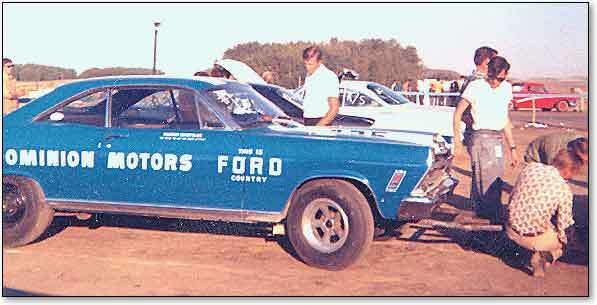 Warren Schettler raced this Fairlane 500. After that it was raced by Vic Halabura. 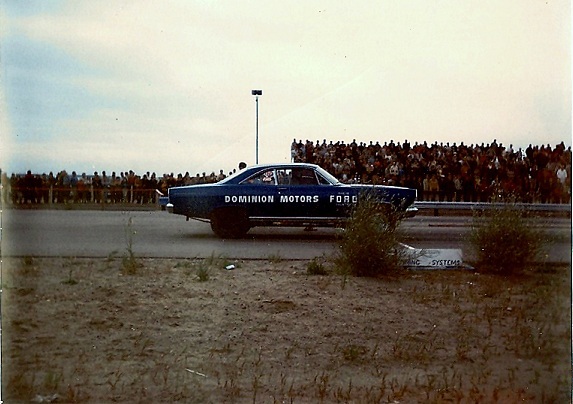 It was reportedly a Holman Moody prepared car and was used on the Canadian Ford drag team. The car won 4/7 races and was later wrecked. The body was sold for parts. Interesting story and a nice car. The picture of the Fairlane was when it was under my care. If you blow up the picture you can make out the writing on the door: "Be nice to me I'm only little....Warren Schettler...." This was because my previous cars always had some kind of a message. The car ran in a Super Stock class and was used as a mule to resolve issues for the recently released side oiler 427 engine. My tenure ended at the end of the 1967 season. 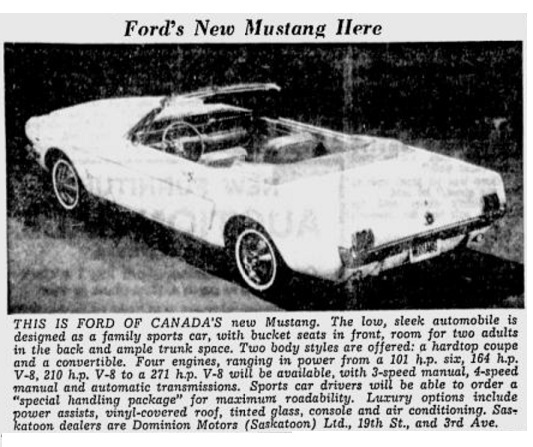 The car was originally ordered for a Saskatoon guy for the 1966 season but did not perform at all well as it was a much larger challenge that he was not prepared for. 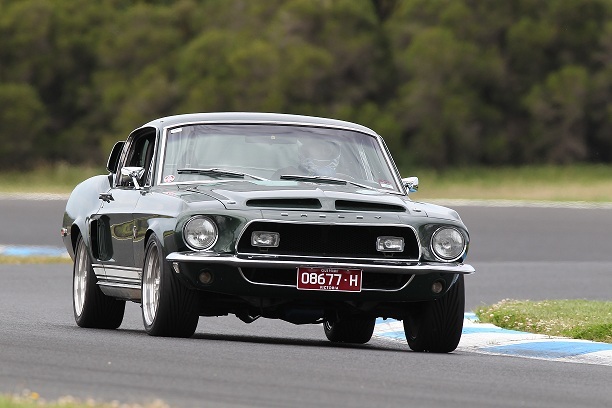 During my time there in 1967, I initiated the Shelby franchise and was part of their requirement to qualify for the franchise. My first company car was a 1967 narrow headlight blue GT500. 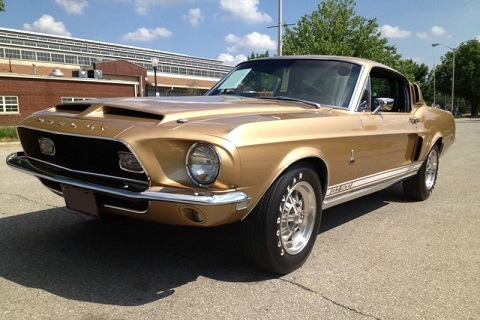 This car was fun for about two weeks after which I exchanged it for a 1967 narrow headlight white GT350. I really liked that car. Vic raced a Chevrolet in 1967 and took over the Fairlane for the 1968 season. If you wish, you can google my name and then enjoy what it was like in the day. I am still involved in drag racing and have recently taken up the design and building of supercharged Ford flathead engines. "After" Picture courtesy of Claire Hicks. 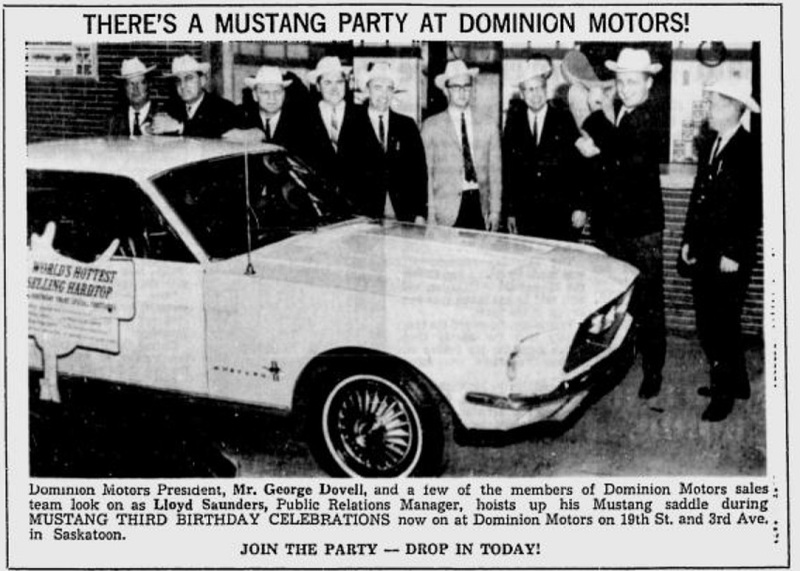 The 1967 Mustangs provided an opportunity for a birthday party at the dealership. There is nothing more fun than a little humiliation. Let's all dress up like cowboys, maybe that will work? 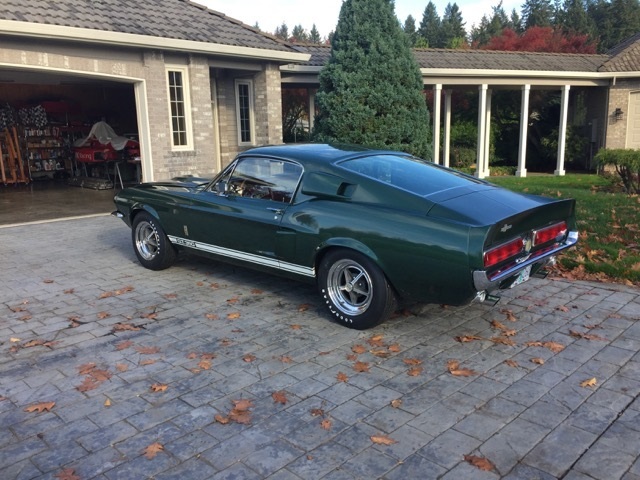 Glen sent along this picture of his 1967. It is car # 1657. It came from Dominion. Not very many 1967 Shelbys did. Could this be the only one? The dealership had a long history, but only sold Shelbys for one year. Fourteen of the fifteen Shelbys they sold were 1968 models. 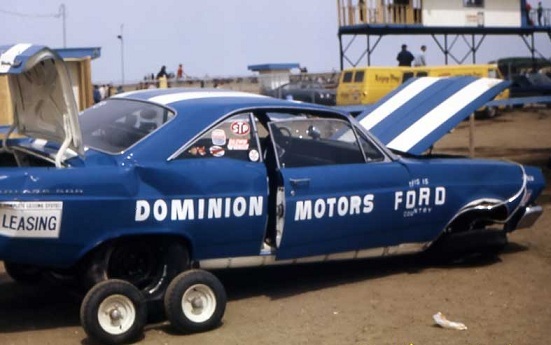 # 1354 was an original Dominion car. It looks very good today. Sunlit Gold always looks good. # 3076 has the distinction of being the only GT500 KR sold by Dominion. Travis makes sure it gets a little track time down under in Australia. The car was used as a demonstrator before being sold. 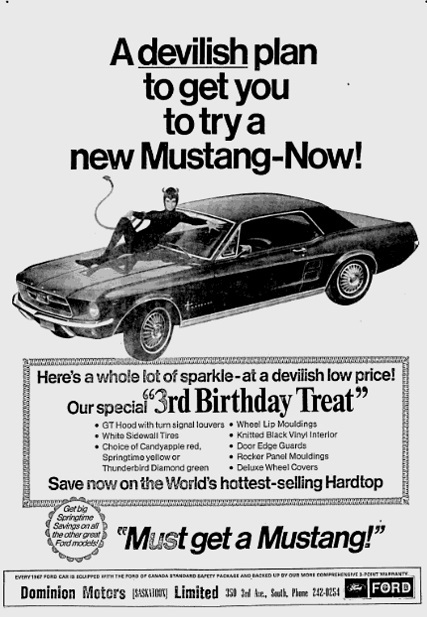 Later it was owned by a friend of Carroll Shelby, actor Michael Ironside. Dominion would close its doors in 1972. It was replaced by Jubilee Ford. Today, the location looks a little different. It is now occupied by an insurance company. If you look closely, you can still see the church steeple in the center of the picture.